Chichen Itza is located in the Yucatan State of Mexico is one of the most well-known monuments of the Mayan people. The monument itself was an important part of the Mayan culture in multiple periods of their early culture. The location served as a place for the Mayan people to honor their gods. Chichen Itza, including El Castillo is one of the most famous temples in all of the world and as such is one of the most popular tours in Mexico. In fact, multiple modernized lists of the 7 wonders of the world include Chichen Itza. It isn’t too surprising. The pyramids have been able to withstand over a thousand years and are still standing. While they may be part ruin, there is still plenty to see and plenty of standing works. This may be partly due to the care with which Chichen Itza was built. 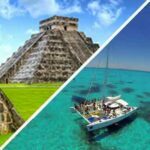 With our Chichen Itza tours from Cancun you can explore the Chichen Itza ruins in a variety of ways from a basic bus tour to a private tour that will be of a great experience. Our tours make sure that you see all of Chichen Itza that you can without feeling rushed. Tour guides will give a detailed experience throughout the trip! 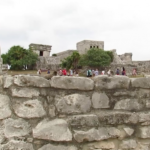 Exploring the Yucatan Peninsula has been a popular activity for many years. There are a lot of sites to see and adventures to be made. We specialize in helping you get on the adventures you want while making the experience something that you won’t forget. One of the best things to do while you are exploring the Peninsula is to swim and snorkel. For our guests, we offer a variety of different snorkeling tours that maximize your time in the water. Each tour offers a different experience to help you enjoy yourself to fullest. Every Cancun snorkeling tour will take you to see beautiful water, special sites, and often times, up close encounters with fish, turtles, and sharks if wanted! Isla Mujeres is a beautiful Mexican island just of the coast of Cancun with a pleasant community. The waters right off the beach are amazing. There aren’t many places where you can see straight down to the bottom of the sea. The island offers a lot different restaurants, bars, shopping markets and places to tour but the snorkeling is really what people really like to do here. 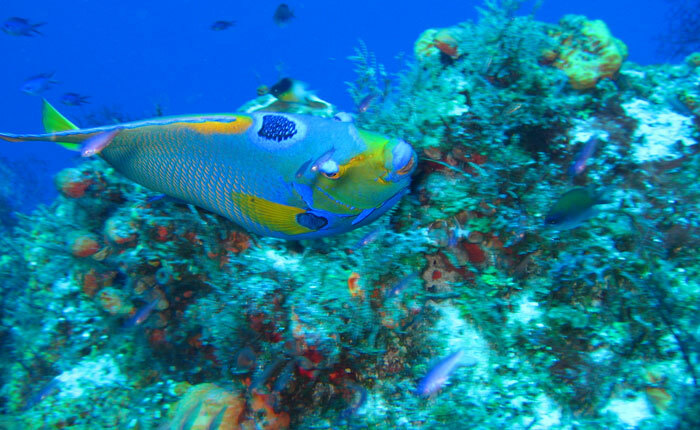 A wide variety of tropical fish call Isla Mujeres home and are easy to find just off the beach. To get to the island we use a Catamaran with an open bar. Yes, you read that right, open bar! During this day trip we will take time to stop at a Caribbean reef for you to enjoy some snorkeling action. You will also get free time on the island and at the Isla Mujeres Beach Club. Depending on weather our tour will take a stop at the famous MUSA underwater museum where you can take in some of the cultural history of Mexico that is down below the surface. Under water statues will greet you as you snorkel. We do have a speed boat tour that takes our guests straight to the underwater museum in Cancun if your wanting a quick trip. There are over 200 statues under the water for you to take in so taking a two-hour trip to the underwater museum is definitely a trip worth taking. Some unique and awesome marine wildlife has created a home out of these statues and you never know what you will see during a stop to the museum. Swimming with fish is fun but when many people think of swimming with sharks they get scared. 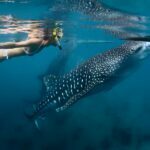 Our Budget Whale Shark Tour is designed to help you become more comfortable with these lovely creatures. The whale shark is among one of the largest fish in the ocean. They grow up to 50 feet in length and are very docile. People who take this tour fall quickly in love with the whale shark when they get to encounter them up close. This is an experience that most people never get. These tours are 6-8 hour tours, the reason for the time fluctuation is that sharks are wild creatures. Part of the trip is going out and locating them. We also offer a deluxe version of this trip which includes soft drinks, water, and beer. On top of that there is also lunch and snacks. Ever wonder what it would be like to cruise underwater in a submarine? Well what if you could experience a personal submarine that will take you around the water. Our Breathing Observation Bubble, or BOB submarine tours take you on an exploration of the Chitales Reef. This reef is perfect for exploring in your own scuba diving submarine and you will be able to see for a distance of up to 30 meters! From plant life to marine life, there are plenty of creatures that inhabit this reef. There are also fun rock formations to check out while you are driving your own personal submarine. If riding in your own personal submarine isn’t your thing, we also offer a tour in a real submarine. The Sub See Explorer will take you from the pickup location out to the underwater museum that we talked about before. 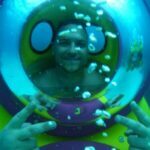 It is one of the most unique snorkeling tours from Cancun because of the fact it takes place in a submarine. 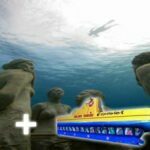 Once at the underwater museum the submarine will sail you around the statues that make up the underwater museum. After that you will get to disembark and explore the ruins with a snorkel. Both views are some of the most unique underwater exploration that you can go on. Cancun snorkeling tours wouldn’t be complete without an adventure that includes both the Caribbean and Cenotes. We have a tour that starts with a snorkel in a giant inlet that is protected from the main part of the Caribbean. You can enjoy the rays from the sun while taking a look at sea turtles and tropical fish. After the dip in the inlet you can travel into the jungles of the Riviera Maya. Snorkeling through these underground rivers and finding caves and other hidden locations is an experience that is hard to find anywhere else in the world. The limestone walls of these pools highlight the crystal blue waters. Stalactites and stalagmites only add to the sites that make these adventures so unique. 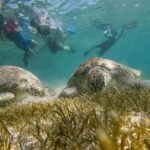 The last tour we offer with snorkeling that we offer is snorkeling tours of the Paradise Islands, two of the most well-known island destinations in the Riviera area. The two islands are Isla Mujeres and Isla Contoy. 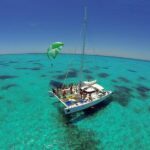 At the start of the tour we take you on a boat and stop for a chance to snorkel in the great Caribbean. There are beautiful fish, wonderful sites, and many things to see while you dive in the water. 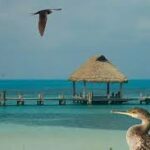 Isla Mujeres is a small town island with bars and things to enjoy, including a wonderful beach club. You will have an hour to explore Isla Mujeres. For most though, they are more excited to explore Contoy Island. Contoy is a national park that takes up the whole island. We take our adventure on a several hour hike across the island to take in the sites. The only building you will see on the whole island is a small museum that is dedicated to the island itself. Bird watchers might have the most fun on this island but it also has some of the best beaches because of the untouched nature of the island. Make sure to bring everything you need for our expeditions into snorkeling tours. You will need comfortable clothes, a swimsuit, sunscreen (we only allow biodegradable), mosquito repellant, and a towel. You might also want to bring cash in order to buy souvenirs and give tips. A camera allows you to capture memories for the years. All of our options for snorkeling tours gives an choice for just about everyone. We plan to make your snorkeling tours from Cancun a real experience. Booking your trips in advance is always recommended because they are some of our more popular trips. People cannot resist the Caribbean sea and want to explore it. Feel free to call or email us if you have questions or want to set up a custom tour.